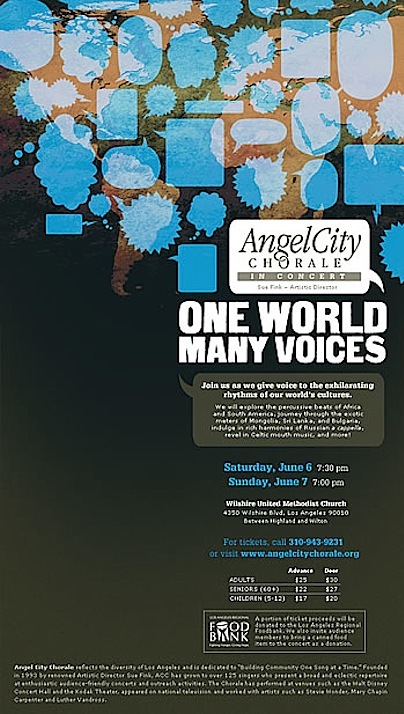 CHRISTOPHER TIN'S BLOG: Angel City Chorale: "One World Many Voices"
Angel City Chorale: "One World Many Voices"
The Angel City Chorale performed 'Baba Yetu' tonight in their One World Many Voices concert--a full evening of music from around the world. At the invitation of the choir, I attended the concert, held at the Wilshire United Methodist Church in Los Angeles. As for the rest of the program, it was a very diverse set list, including songs from Bulgaria, Argentina, Russia, Mongolia... really, it was right up my alley. Kudos to Sue Fink, the Artistic Director of the choir, for such challenging and diverse programming! They're doing one more performance tomorrow night, Sunday June 7th, at 7:00 PM. Los Angeles locals should consider checking them out--they're quite an impressive group. Click here for more info. Hopefully I'll get to work with them some more, perhaps on some future choral works--perhaps even some of the songs on Calling All Dawns. 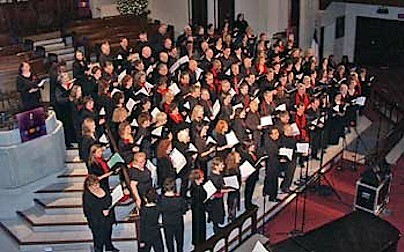 Thanks for the oh-so-positive feedback about last night's concert by Angel City Chorale! As always, we had a great time performing and it was especially energizing to have you, as the composer of one of our songs, in our audience. Thanks for composing such a wonderful song. It was an honor to have you in the audience last night. Hope we'll have the opportunity to perform more of your work. I'm a member of ACC who happened to sit in the audience last night instead of singing. I loved the performance of "Baba Yetu" and plan to hear it again tonight from the balcony! Baba Yetu is one of my favorite songs from this concert. It was so amazing to perform it and know that you were in the audience. I hope we get to do more of your works; you are oh so talented! Thanks for being a part of our show last night. We were nervous about having THE composer in the audience, and thrilled that it was a huge success. My favorite part is the choral crescendo "Na mi le le" behind the soloist, leading up to the D-major section. We hope to see you again soon! It was a joy to sing "Baba Yetu" and you will be happy to know it was my family's favorite! I do hope Angel City Chorale will be singing more of your music in the future. Christopher, it was an honor to have you in the audience and it was one of my favorite songs in the concert to sing. Thanks for being there and sharing it with us.